Colour blocking, the trend of using bold blocks of colour in both fashion and interiors, has been in popular culture since the 1940’s. Dutch artist, Piet Mondrian’s famous compositions in red, blue and yellow kickstarted the simplified used of colour and heralded the new era of Neoplasticism and abstract art. The artist’s bold geometric designs easily translated into interior design, being applied to walls and cabinetry with great success. The style became increasingly popular in the 1950’s with colourful furniture pieces by designers like Eero Saarinen, Arne Jacobsen, and Charles and Ray Eames being seen in fashionable homes around the world. After losing some prominence for a few decades, colour blocking is back, and it looks like it’s here to stay. Because of its inherently linear design, the kitchen is one of the rooms in the home where the trend can easily be incorporated. Whether you choose to bring colour blocks into the interior design of your kitchen through the cabinetry, floors, walls or accessories, it’s a great way to add vibrancy and personality to your kitchen. Here are seven of our favourite kitchens that successfully incorporate colour blocking in a very creative way. 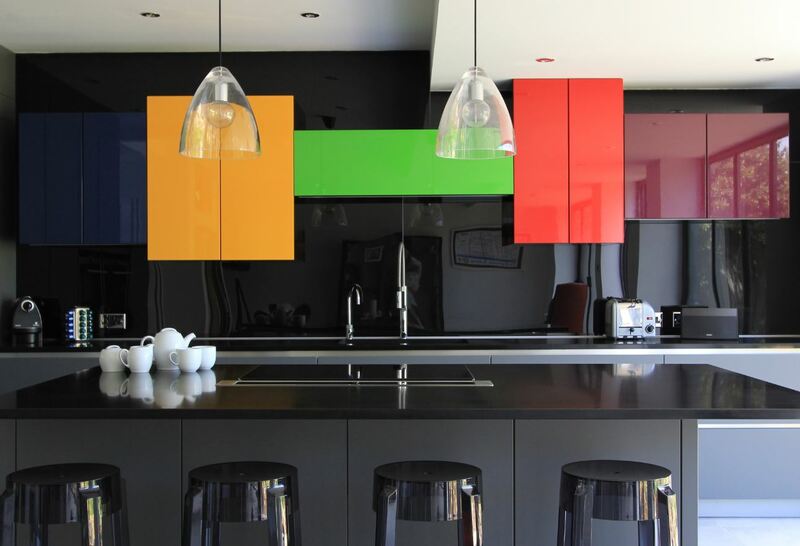 Liven up a very minimalist kitchen with colour blocking introduced in the sliding doors of the cabinetry. This kitchen uses a vintage palette of dusty pink, mustard, bright orange, light blue and sea green to provide a fresh take on bringing colour into the kitchen without cluttering it. The ingenious use of texture in the pegboard and wood grain cabinetry further add subtle tonal variations in this single wall kitchen. Contrasting colours are often used in colour blocking. Two colours that are equal in intensity are applied in equal measure to provide a harmonious interior. Choose one colour as a background colour and add the contrasting colour sprinkled on different surfaces throughout the room. In this small kitchen, walls painted in a strong blue colour are balanced by accessories in contrasting reds and pinks, creating a vibrant and happy kitchen area. The success of this palette lies in the rest of the cabinetry and finishes in the room providing a completely blank canvass for the colours to pop against. This kitchen with its traditional architecture was given a completely modern make-over with bright yellow epoxy floors. The colour is echoed in a few matching cabinets randomly placed around the room. The vibrant yellow is allowed to remain the star of the room, with black, grey and deep midnight blue cabinets in a supporting role. The success of the design lies in the stark contrast provided not only by the colours but also of the modern and minimalist lines in contrast with the old-world brickwork of the hearth. Colour blocking doesn’t necessarily have to be bold and bright: any light colour can be introduced to a room with equal success. Subtle fern green panels and edge trim provide a beautiful balance in this kitchen with its heavy textures and masculine lines. The strong industrial elements are given a natural touch with wood accessories and painted cabinet carcasses. A few plants placed on the open display shelving and windowsill provide further splashes of colour. There is no better way to give centre-stage to colour in the kitchen than with a centrally-placed kitchen island. This beautifully feminine kitchen makes use of a soft pink island set against a monochromatic white-and-charcoal background. The island is allowed to be the main focus in this room, with no other features detracting from its prominence. The rose gold hardware and oak herringbone floor with their subtle pink tones further compliment the scheme. These faceted kitchen cabinets take colour blocking to a new level and provide a strong focal point in this open-plan living and dining area. Working with several different shades of yellow, green and red, the composition of cabinets reminds of Mondrian’s original inspiration for the style. Notice how the lower cabinets, wall, and ceiling trim contrast with the black painted splashback to strengthen the intensity of the colours further. There are no rules when it comes to colour blocking. In this kitchen, most of the surfaces are getting a different colour treatment, with great effect. With a play on the primary colours of red, yellow and blue combined with pale green, this industrial style kitchen makes great use of both coloured cabinets and an epoxy floor. The bright red bar stools provide a fresh pop of colour against the neutral island unit. This kitchen also takes the trend further by extending the coloured wall cladding into the adjacent living areas.